The Ashanti Regional Youth Organiser of the National Democratic Congress (NDC), Ernest Brogya Genfi, who made a last minute entry to contest the Suame seat, has been disqualified. He was disqualified on grounds of forged signatories to his endorsed forms and his inability to pay the filing fee. Subsequently, the party is to initiate criminal investigations against Mr Genfi for forging 122 signatures of the 128 branch members he claimed to have endorsed his forms, including one alleged dead person called Cosmos Bayor. The constituency secretary, Nurudeen Haruna, told a press conference on Monday that Mr Genfi took advantage of the extension of the filing date from September 10 to September 17 but failed to meet the requirement, including a bank draft of GH¢10,000 and a curriculum vitae. 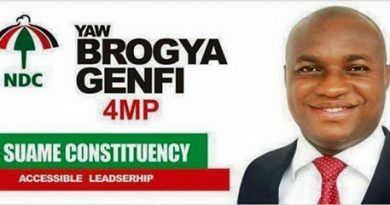 ‘The party executives also unearthed that Mr Brogya Genfi’s document was ‘loaded’ with false data concerning the party’s branch executives who he claimed to have endorsed his nomination forms even with a dead person’s ID card number (309/4 Cosmos Bayor). The constituency secretary said the party was compelled to come out to clear the air after Mr Genfi allegedly put on various social media that his forms had been accepted by the chairman of the constituency, Amadu Ali. In response, Mr Ali said when the anomalies were detected on Mr Genfi’s forms, he was advised to do the right thing and ensure that they were submitted together with the bank draft of the value of the filing fee. The chairman said rather than adhering to the ‘wise counsel,’ Mr Genfi went viral with the issue compelling the constituency executive to come out with the ‘false data’ on his forms. The party said it recognised only Mr Francis Dodovi, a member of the party’s communication’s team, as the candidate to contest on the ticket of the party in the 2016 general election. Meanwhile’s deputy Ashanti regional communication director, of NDC Solomon Anane in an interview with ghnewsnow Kumasi desk refuted the report. “Brogya is still in the competition the constituency executives cannot disqualify any party member for contesting” he added. ← Political Parties Advised To Be Objective In Resolving Grievances.